In early March, investors in Saigon flocked to Can Gio to hunt houses and land, causing real estate prices in this island district to increase. This is seen as a wave of real estate investment that follows the development of infrastructure information, old investment trends that have existed for decades in Saigon. At the beginning of the week, the architectural design plan for Can Gio Bridge has just been selected and announced by the HCM City People's Committee after a long time, this infrastructure has just stopped at the starting level, considering the design plan ... This has warmed up the housing market, which lacks positive support information in the past 6-9 months. According to the design plan announced by Ho Chi Minh City in March 2019, Can Gio Bridge will be a cable-stayed bridge with the idea of ​​sketching a typical mangrove tree image of Can Gio district (forest biosphere reserve area). 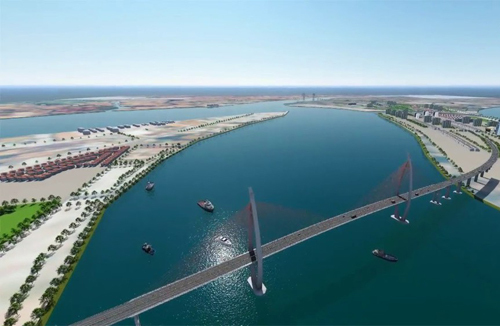 This infrastructure has the mission of replacing Binh Khanh ferry, connecting Can Gio district with the city center, the bridge is expected to need VND 5,300 billion. Although it is only an information at the pre-preparation stage, real estate investors in Can Gio are still quite affected. On weekends, the housing market in many communes in Can Gio district attracts a lot of investors to buy land. Hot spots attracting the attention of real estate traders focus on 2 communes. Leading the way is Binh Khanh commune - directly connected to Can Gio bridge and next to Can Thanh commune - the area connecting the island district center with the model of sea metropolitan.